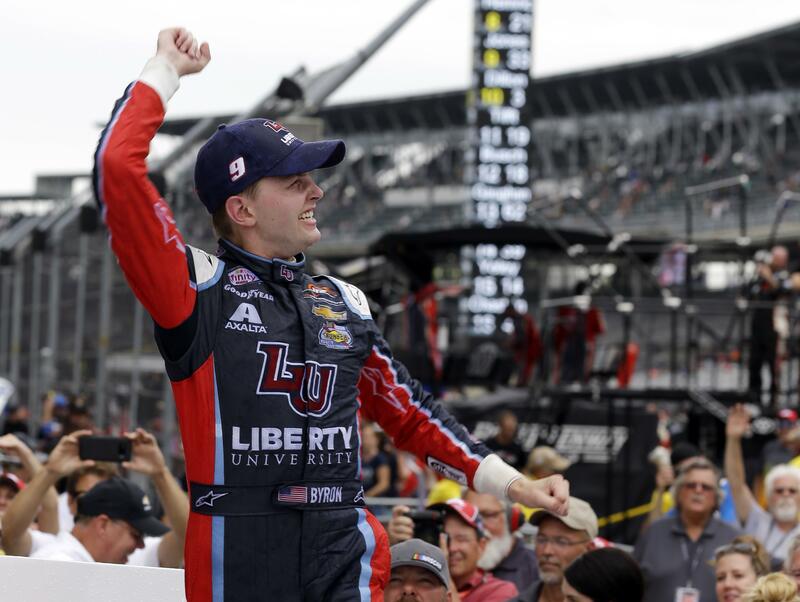 UPDATED: Sat., July 22, 2017, 4:50 p.m.
INDIANAPOLIS – William Byron’s first trip to Indianapolis Motor Speedway ended with an unforgettable finish. After taking the lead with 15 laps left, the teenage rookie used some savvy moves and a little luck Saturday to hold off the hard-charging Paul Menard for his third NASCAR Xfinity Series win in less than a month. The margin of 0.108 seconds was the narrowest in race history, and he did it by successfully blocking the 2011 Brickyard 400 winner for the final two laps while dealing with a troublesome tire for the final 20. At 19 years, 7 months, 23 days, Byron became the youngest winner of a major race on Indy’s historic 2.5-mile oval. Brazil’s Matheus Leist set the previous mark in May when he won the Indy Lights race at 19 years, 8 months, 19 days. And in three short weeks, Byron has visited victory lane at two tracks – Daytona and Indy – that often torment more experienced drivers. Getting there Saturday sure wasn’t easy. Byron and the series’ other drivers used restrictor plates, new air ducts and a different splitter in hopes of making the race more competitive than in past years. In part, it worked. Eight drivers traded the lead 16 times, both race records. And before Menard pressed the issue, Byron had to hold off Joey Logano, who finished third more than three seconds back. But there was plenty of single-file racing, too. Series officials will now debate whether a similar package would make for a more entertaining Cup race next September. One driver who would vote against it is Kyle Busch, whose four-race winning streak at Indy ended. He wound up 12th, tying Michael Schumacher’s track record for most consecutive wins in a race car. Marc Marquez won five straight in on two wheels in the MotoGP. Byron, unlike Busch, had no complaints. And he leaves with a win. Byron also narrowly held on to win the first of three stages, beating Busch by 0.113 seconds. Pole-winner Elliott Sadler won the second stage under caution, just ahead of Brennan Poole. Busch looked like he would hold on to win the final stage until he drove onto pit road with 18 laps to go, turning the lead over Sadler. Busch never led another lap. “I’m still not sure why we did what we did,” Busch said. A post-race inspection also showed Erik Jones’ car was missing a lugnut. Justin Allgaier’s solid run was undone in the pits. On one stop, two crew members scrambled to get out of the way of the No. 7 car – with one leaping over the right fender as Allgaier drove into the pit box. Fortunately, nobody was seriously hurt. But a green flag pit stop with four laps left in the second stage took Allgaier out of contention for good. He pulled out of his pit box before the crew signaled to go, running over a hose and dragging it into the next pit box where it ripped. The damage to the right front tire eventually caused damage to the fender and forced Allgaier to stop on the track before the tire came loose. Busch and Byron have combined for the last five wins in the series. The duel will resume next Saturday at Iowa. Published: July 22, 2017, 3:17 p.m. Updated: July 22, 2017, 4:50 p.m.